Author: Subject: 6x9's in the back deck? 6x9's in the back deck? I just bought some Infinity 9602i 6x9's that sound awesome to replace the crappy back-door Kenwood (they wouldn't even put their name on them) supposedly "500 watt" jammers. They're paperweights. 1.) get some extender rings to lift them up so only the magnet and back of the basket stick into the holes. This may not work due to the steep slope of the window. 2.) Get out the grinder. Oh crap. What have I gotten myself into? 3.) Replace the trunk lift rods with pressure cylinders and mount the speakers under the deck. Yow. The Infinity's sound better unmounted than the "Precision" units do mounted. I gotta do this. I'm with Ed... start cutting and go custom. After measuring and playing around with the rods removed I realized you guys are right. Cutting would be necessary, then grilles and whatever. So, I swapped out my old "Roadbastard" 6x9's in my truck for the Infinity's, and decided to save some bucks up for some Pioneer 6-1/2's... I think they're called Premier or something like that. Guy tells me you wouldn't believe how loud they are and have good midbass. $189.00 US, new. I have Pioneers similar to the ones you are talking about in my rear deck now and I love them. 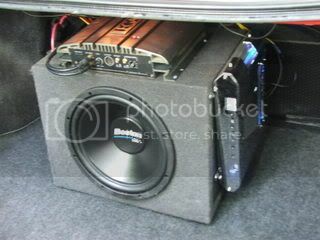 Not sure about the midlevel bass though since my sub is always on. outrun anyone, I might as well enjoy the ride, hey?